Hobnob is THE way to get together with the people you care about most. 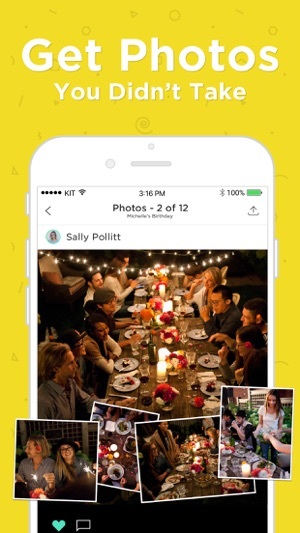 Organize your group, make an invite, get lightning fast RSVPs, chat instantly and see all the photos you didn’t take. Organize and chat with all the groups you actually spend time with in real life. 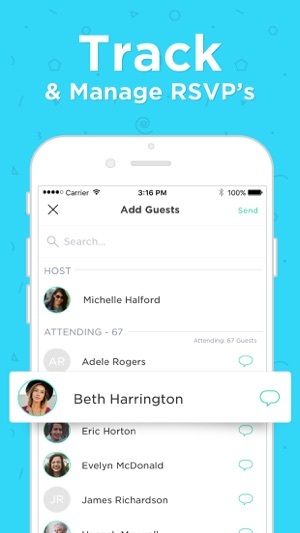 With one tap, make any group a guest list to easily invite the whole group. See all the events and photos you shared with the group in one place. 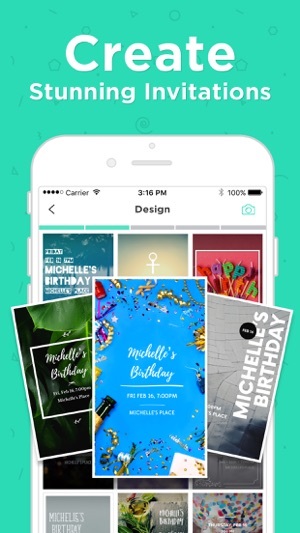 Look like you hired a professional designer by creating a stunning invite in seconds. Get lightning fast RSVPs! Guests can just reply to the text to RSVP, so you get super fast responses. An hour before the event your guests will get a text with a link to a map and directions! We automatically ask your guests to share photos, so you get to see all the photos from the party. Send instant text updates when details change or to just say thanks for coming. Price may vary by location. Payment will be charged to your iTunes Account at confirmation of purchase. Your subscription will automatically renew unless auto-renew is turned off at least 24-hours before the end of the current period. Your account will be charged for renewal within 24-hours prior to the end of the current period. You may manage your subscription and auto-renewal may be turned off by going to your Account Settings after purchase. Any unused portion of a free trial period, if offered, will be forfeited when you purchase a subscription. Hobnob is the best way to send Text Invites, get fast RSVPs, message your guests, and get photos from events! New in 4.0: We've consolidated groups and communities under one new, unified concept called Spaces! For you, your crew and all that you do! We've also streamlined the entire app to make it more intuitive and easier to use. This app is, put simply, a huge time saver. The interface is simple and straightforward but well-designed and functional. The few times I've had issues I've written into their support and their friendly, understanding support staff is helpful and and they get back to me quickly. I paid for it, and I'm glad I did. It keeps me organized and makes me look good to my guests. It's not spammy or riddled with ads like evite and it's a way better value than paperless post. I'd rather pay a few bucks for a high quality app than look like a cheap-o sending spammy, ugly looking invites for my events. Thanks Hobnob! I was really excited about using this service however my daughter and I spent time creating her birthday invite and I set her as a cohost. All seemed great until she tried to invite a guest. The app shows the invite was sent and delivered to the correct phone number as a text, but the guest never got the invite. We tried multiple times and still nothing. This is making this app completely useless as the intent of sending invites via text message is not working properly. I have even activated the free trail which will charge my card once the week is up and it still isn’t working correctly. Update- in response to the developer’s response......The persons phone was right next to me. They did not have the app installed and did NOT get the text message with the invite. The app makes it seem that the person does not need the app to be notified they have an invite. It makes it hard to use because you then are forced to make sure everyone you invite downloads the app first so they get notified. No one lied about anything. If you feel this is incorrect, we'd be happy to investigate. Please send us a note at help@hobnob.io so we can investigate further. Response to your update: Guests do not need the app to receive the invite. If the guest did not have the app and was not receiving the text message then it is likely an issue with their specific phone plan. Some people either a) do not have a text messaging plan because they use iMessage only or b) have a carrier block on their phone plan for short codes. Hobnob does indeed work for most people. As I mentioned previously, if you like, we're happy to look into this specific case by contacting our carrier partners but we'd need you to email help@hobnob.io with your information so we can look up your account. 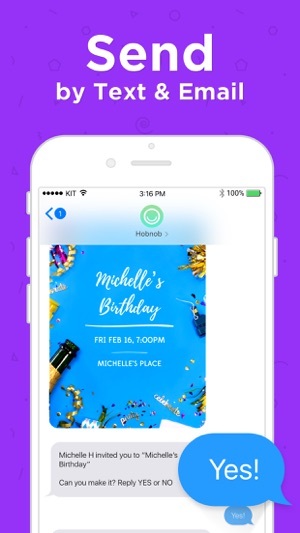 Hobnob does a lot of things well, and my favorite part is the fact that you can send invites through text message because it’s faster and more interesting than sending them via email. BUT there are some bugs that I’m hoping get addressed soon. Picture management is a challenge. After I upload photos, they display in “random order” and definitely not in the order I selected. That’s confusing to invitees. Also, it’s not obvious whether or not you can download and save photos (I assume you can but I haven’t figured it out yet). It would be super cool if you could also add video clips in the same storage area. Also, the app doesn’t update when people respond to invites so it feels very clunky at times... I have to close and re-launch the app just to get it to display the right number of RSVPs. Overall, I like Hobnob but would have to see a lot of improvement to stay loyal. On the plus side, their customer service team has been very helpful when I’ve reached out to them. Hi there! Thanks for the feedback. The photo feature was designed to be used to aggregate photos from the event itself so the photos are ordered by the date the photo was taken. When used to collect event photos this means that all the photos show up in the order they were taken at the party which makes the photo gallery feel like a single stream of photos from multiple perspectives. We can see how if you're uploading other random photos before the event how that would be confusing so we'll work on a way to allow you to re-order the photos manually. To save a photo: When you're viewing an event photo you can tap the "share" icon (upwards arrow) on the top right of that photo to share or save it. We will be adding the ability to upload video too in the future. We'll investigate the app not showing updated event RSVP count information. We haven't heard that complaint. Thanks for reporting it! Thanks again for all your feedback and for using Hobnob! Don't hesitate to reach out to us at help@hobnob.io if you need anything else!